Deep clean and polish your floors in one easy step. This advanced pad features a combination of fibers to make your job easier, and improve your results in the process. Use it wet or dry on any type of hard floor to quickly clean without any soap or harsh chemicals necessary. It is perfect for hardwood, linoleum and tile, and it also works well for glass, so use it to wash windows and skylights too. Alternating strips reduce tension on the surface, and improve scrubbing power, so it will be effortless to push across your floor, and you will lift up more dirt in a short amount of time. 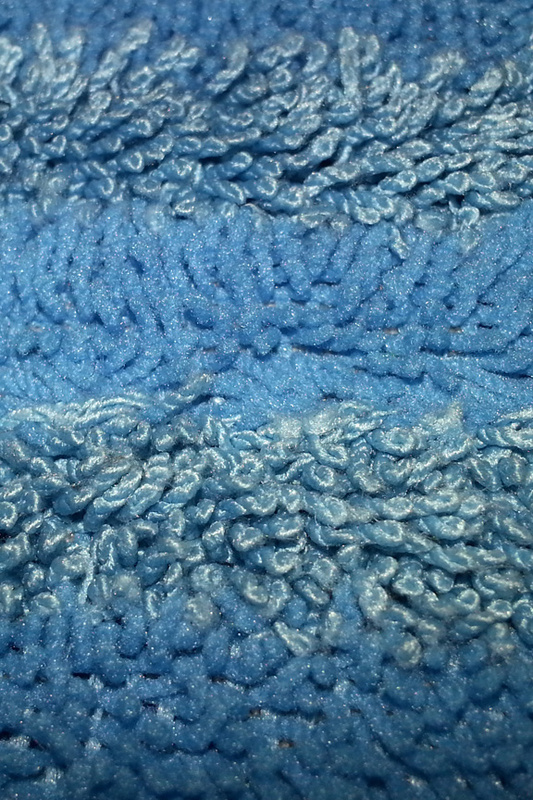 One stripe has soft fibers with split ends, and the other stripe has looped fibers with more durable ends. The two surfaces combined offer gentle and thorough cleaning that actually shines as it eliminates the grime. Wash each pad hundreds of times before it wears out, and use with any mop brand it fits on. Want to order several pads? Receive quantity discounts when you get more than one in the same order, or choose our 4-Pack or 5-Pack to save money when ordering a variety. To check out the other pads we have available in hte same size, use the following links: Multipurpose, Scrubbing, Dusting, Heavy Duty. Top Quality. Superior materials are used to make it, so it will clean better and last longer when compared to other, cheaper versions available. Compatible. The perfect compliment to the mops we carry, but also usable with a wide range of other models too. If you want to improve performance, a better pad is the perfect way. Use on any head with the same connection method and a similar overall size. Washable. Unlike disposable alternatives, this powerful pad is totally washable and reusable. 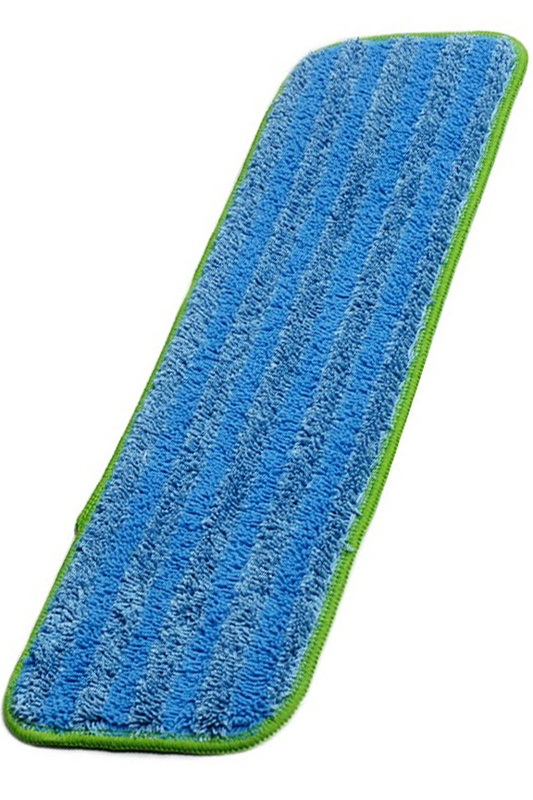 Unlike other ones that are washable, this one cleans better and lasts longer. Versatile. Intended for wet use, you can really use it wet or dry. Deep clean, polish, or gives floors a light dust mopping with this one pad. Environmentally Friendly. No dangerous chemicals to dispose of, and no dirty parts to toss when you finish. When compared to disposable tools, this one is way better for the environment. It measures eighteen inches by five inches, and it is meant to hang over on all sides when connected to a plastic or metal mop head. Get wet with water and wring until damp, or use dry on any floor type. When damp it will lift dirt and polish without the need for soap, and when dry it can absorb moisture, or lightly dust with the attractive fibers. It will never harm or mark any surface you use it on, and it will always clean to a spot-free, streak-free and lint-free shine. Because you only need a teeny bit of moisture, any type of wood floor is safe to clean with this tool. Don't pay more to get the same thing elsewhere, and don't waste money on similar items that won't work as well. This pad is proven to perform well, and it will last a long time. Uses Clean and shine any hard floor. Polishing mop pads from StarFiber. Use wet deep clean and polish any smooth surface. Perfect for any hard flooring, but also great for windows, mirror skylights and more. Machine washable hundreds of times.